Shabina Mohd. 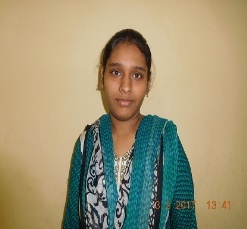 Shamim Shaikh, 18 years stays in 90 Feet Road, Dharavi with her family comprising of 8 members. Her is an electrician and has two wives, her mother being the first. They reside together. She was totally unaware about Gift Wrapping and what its training was all about. According to her, she says that “Meera madam was always guiding for us at every stage, she informed us about the Gift Wrapping course of free of cost for community girls and then I joined. At beginning it was difficult to learn but almost after two months I became little bit expert and I can teach other also. On 22nd April 2017, Meera Madam sent me and Varsha to Anita Chopra madam at Colaba for two days for gift wrapping work and it was very exciting to us. It was our first time to go so far away alone, our parents were tense at the beginning but it was safe and secure journey till Colaba and return at evening.